Passing through the outer or event horizon of a black hole would be uneventful for a massive black hole. Physicists have insisted for a long time that black holes are impenetrable ciphers. Whatever goes in is lost, impossible to study or meaningfully understand. Some small amount of matter and energy might escape a black hole in the form of "Hawking radiation," but anything still inside the black hole is functionally disappeared from the physical universe. The idea is a basic premise of modern physics: If something falls into a black hole, it can't be contacted, it's future can't be predicted. No observer could possibly survive traveling into the dark space, not even long enough to glance around and notice a few things before being annihilated. Now, a team of mathematicians and physicists scattered across Portugal, Canada, the Netherlands and the United States is trying to poke a hole in the hypothesis. It's just a pinprick, but it's already sparked a rush of interest and research from their colleagues. To understand why this is such a big deal to physicists, you have to understand how they think about the universe. The notion that black holes must be walled off, that their interiors are necessarily impossible to observe, is called the cosmic censorship hypothesis. First proposed by mathematician Roger Penrose in 1969 and later debated by the likes of Stephen Hawking and Kip Thorne, it's been modified over the decades and has never been formally stated as a theory. But for certain researchers, it's something like an article of faith, backed up by how neatly it ties up certain loose ends in modern models of the universe. But the new paper implies that in the border regions of these special black holes, cosmic censorship breaks down. An observer could travel beyond the zone of what physics can predict and watch what happens there. And if that's true, it would mean the world of physics that makes sense is starting to leak into the zone of the incomprehensible. A physicist wants the universe to work like a clockwork mechanism. Set all the initial conditions — put this star here, that planet there and a wave of energy over in that corner — and the laws of the universe dictate exactly how the whole system will evolve over any length of time. Physics assumes that every speck of matter is on a kind of invisible train track, careening from one inevitable destination to the next. Even if human beings and their supercomputers can't always predict the future, physicists generally assume the future is already determined. Even quantum mechanics, with its weird uncertainties and deep randomness, doesn't really violate that essential physical determinism. "With quantum mechanics, of course you don't have determinism in the sense of predicting, say, exactly when an atom is going to decay," study co-author Peter Hintz, a mathematician based at the University of California, Berkeley and a research fellow at the Clay Mathematics Institute, said in an interview with Live Science "But you can, however, predict the probability distributions of when that atom is most likely going to decay [and when it isn't likely to decay]." The quantum-mechanical view of a universe of evolving, intersecting probability distributions is a lot wilder and more confusing than Newton's world, or even Einstein's. But it's still fundamentally deterministic. Everything in creation is trapped on its mind-bending course through the eons. What's the force of gravity at this point? Infinity. How curved is spacetime over here? Infinitely. That's just not a situation our physics can grapple with. Whatever does go on inside a singularity, modern physics isn't up to the task of figuring it out. And, at least according to the principle of cosmic censorship as Penrose explained it, scientists operating in our universe can't figure it out. The knowledge is forbidden by the structure of space-time: All the known singularities are either locked away beyond impenetrable event horizons of black holes or in the incomprehensible history of the first moment of the Big Bang. If the Jan. 17 paper is just a pinprick, it's one that threatens to widen until it tears a big gash through the whole idea of cosmic censorship. 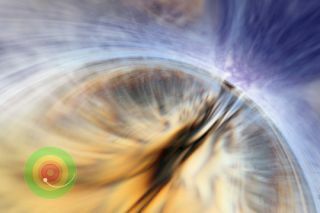 Hintz and his colleagues showed that, under certain circumstances, the wall of death around black holes could break down. When scientists argue the case for cosmic censorship at the border regions of black holes, a critical point they make has to do with how energy behaves as it approaches a singularity. If you shine a white light at an astronaut falling toward the event horizon, that time dilation will — from that astronaut's perspective — cause the light to appear to change. As time moves more slowly for them, but at the same rate for the flashlight pumping out wave after wave from a fixed location, the peaks of each wave will seem to arrive at the astronaut faster and faster as that astronaut moves into slower and slower regions of time near the black hole. When the wave peaks of a beam of electromagnetic radiation (including visible light) start coming faster and faster, that means that (from the perspective of the tumbling astronaut) the frequency is getting faster. The astronaut sees the light blue-shifting as the frequency goes up and carrying more energy per second. It's the last defense of comprehensible physics against the void, like the three-headed dog guarding the gates of hell: Travel here, observer, and you will be obliterated. Or maybe not. Hintz and his colleagues built a model in which the wall of blue-shifted energy would disappear. "We study this universe where there is just one black hole, which would be a very late stage of the evolution of the universe where all of the other matter, like you and me, has decayed or disappeared into very distant singularities," he said. "It's a black, bleak place." And this black hole they described is unusual. It has a very strong electromagnetic charge. Under normal circumstances, strongly charged particles tend to attract one another, positive and negative, and cancel each other out. Our world has pockets of strong charge — your hair after rubbing a balloon on it for a while, for example — but any massive body tends to average out to a charge of just about zero. It's likely that not a single black hole of the kind Hintz and his colleagues studied exists in the real universe, he said. Physicists study charged black holes, though, Hintz said, because they tend to be pretty good analogies for rapidly spinning black holes, which almost certainly do exist but are much more difficult to do calculations with. "Charge is a poor man's angular momentum [spin]," Hintz said. They're not the same, but their effects are similar enough that physicists sometimes substitute one for another in studying black holes. And it turns out that, in the case of a charged black hole that's charged strongly enough, another effect would overwhelm the blue shift, and might save that astronaut's life: Energy decays as it approaches the black hole, and in the case of the black hole they studied, it would actually decay faster than it blue-shifted. Instead of peaking at an infinite energy in this black hole's border region, it would peter out, harmless, at the border, the researchers said. "If you don't die [don't get eradicated from physical existence as we know it] when you cross the horizon, then determinism breaks down, because you can't actually predict what's going to happen afterwards," Hintz said. The idea is such a sufficiently stunning rebuke to the way physicists see the world that it provoked an almost immediate follow-up. Without the extreme circumstances of the charged black holes Hintz and his colleagues studied, they found cosmic censorship still intact. Beams of energy would still decay when approaching the sort of singularity they modeled, but not fast enough to prevent that deadly blue-shift. A deadly fire still burns at this much more likely border region of reality. Hintz said it's important to understand that his and his colleague's model of the universe is "far-fetched." But this kind of abstract research can pierce widely accepted notions of reality and open up areas of inquiry in ways experimental science cannot. "It's very hard to sort of come up with smoking-gun experimental evidence from the outside that something is going on inside of black holes," he said. But this research shows that, regardless of whether we'll ever see it, something from our universe just might be able to take a look.